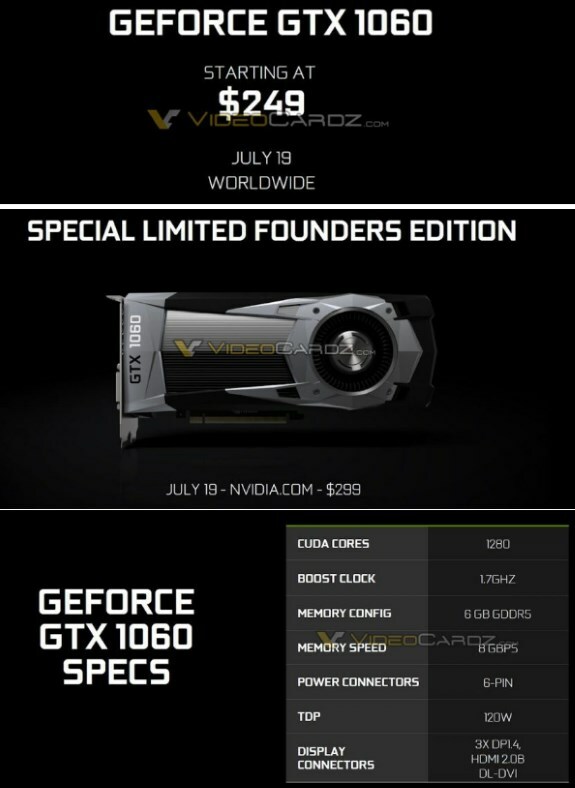 NVIDIA GeForce GTX 1060 6GB starts at $249, available on July 19? Alea iacta est, every GPU enthusiast can take a breather as VideoCardz got its hands on several exciting launch details about NVIDIA's GeForce GTX 1060. First up, the slides indicate NVIDIA's new mainstream gaming card will start shipping on July 19. Pricing starts at $249 for the add-in board (AIB) partner versions, whereas the Founders Edition from NVIDIA will command a $299 price tag. The real question perhaps is when these $249 cards will be able. Given that leaks indicate this card will offer performance comparable to the GeForce GTX 980, it seems like NVIDIA spoiled AMD's Radeon RX 480 party. The leaked slides indicate the GP106 GPU of the GeForce GTX 1060 features 1280 CUDA cores, a 1.7GHz Boost clockspeed, 6GB GDDR5 memory clocked at 8000MHz, a 6-pin PCIe power connector and a 120W TDP. Display outputs include 3x DisplayPort 1.4, 1x HDMI 2.0b and 1x DL-DVI. Based on these slides, it seems the rumors about a 3GB model were false.